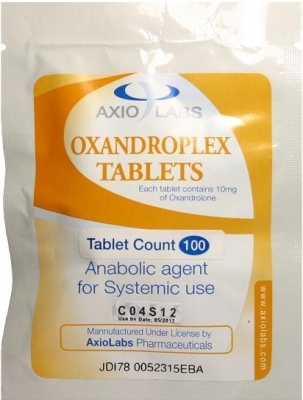 Oxandroplex by Axiolabs is one of the few steroids that are considered as one of the mildest steroids that there is. It is moderated anabolic and androgenic. This drug is also called Anavar. It has its beginning in USA from 1964. At that time as many of anabolic steroids it was used in medicine. It was used mostly for children to stimulate growth and in women to prevent osteoporosis. Later because it cause a strong strength gain by stimulating the phosphocreatine synthesis in the muscle cell without depositing water in the joints and the muscles it became popular between bodybuilders. To obtain more harder and quality muscles some bodybuilders use combination of Oxandrolone and Halotestin(20-30mg). Another stack that is considered effectively is Oxandrolone and Clenbuterol(120-140 mcg). Also good results can be achieved by combinind Anavar with Winstrol(50mg/every 2 days), Parabolan, Masteron, Primobolan or Testosterone Propionate (50mg/every 2 days). Truly, Oxandroplex is a almost perfect steroid. Anavar has a relatively short half life of about 8 hours. So one may chose to split dosages throughout the day in order to keep blood levels as stable as possible.